Experiential dining has never been hotter, and this summer Vancouver will see the trend taken to new heights – literally. Dinner in the Sky is a distinctive dining experience that lifts guests more than 150 feet off the ground for a sky-high feast that pairs decadent dishes with stunning views. 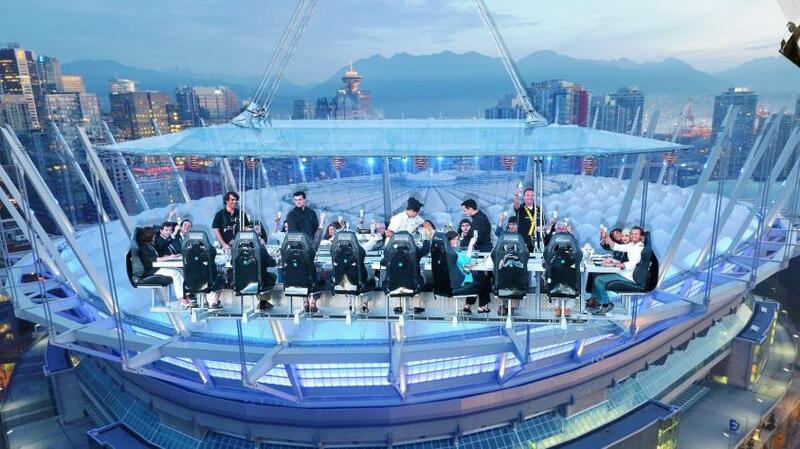 The first “skydine” took place in Belgium, and since then the event has been hosted in more than 40 countries around the world. Vancouver’s stunning surroundings proved a natural fit as a new destination in which to host this Instagram-worthy event, which dishes up courses inspired by the most recent culinary trends. Each seating lasts one hour with a maximum of 22 people accommodated per event. Most importantly – bathrooms are available in the lower lounge prior to lift-off, and the platform is lowered halfway through service for another bio break. Visitors and locals can hop aboard Dinner in the Sky between July 1 and 31, 2017. Tickets start at $296 per person for lunch or brunch (two-course meal, champagne/mimosa and a starter), and extend to $917 per person for a first-class experience (five-course meal, raw bar, champagne, wine, a video and photo, pickup service and more). Early ticket reservation is recommended, as the event tends to sell out quickly. See you in the sky!